The spiral galaxy Messier 66 is located at a distance of about 35 million light-years in the constellation of Leo (The Lion). Together with Messier 65 and NGC 3628, Messier 66 is a member of the Leo Triplet, a trio of interacting spiral galaxies. Like all the galaxies in LEGUS, Messier 66 is undergoing vigorous star and star-cluster formation. One of the goals of LEGUS is to sample star-forming regions across each galaxy. Because the galaxies are relatively close to Earth, Hubble can resolve individual stars. An image of this galaxy was already released back in 2010. 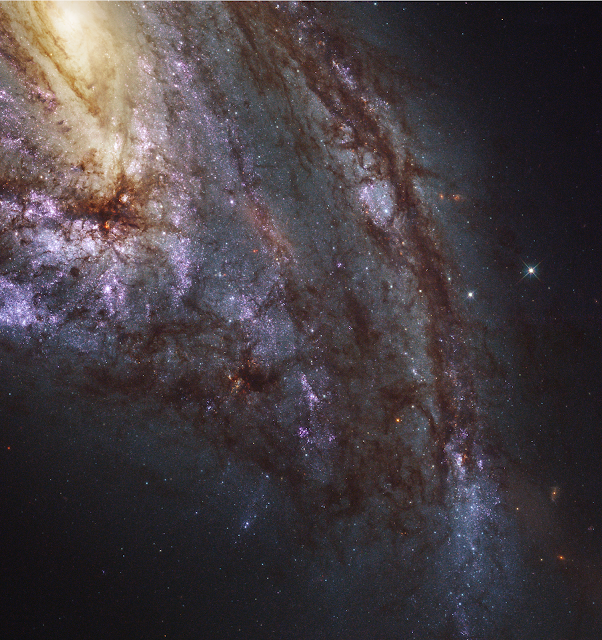 This newly-processed image now also shows ultraviolet radiation Hubble captured from the galaxy.